Friday night’s edition of Showtime’s Shobox: The New Generation was a breath of fresh air as the show stayed true to its mission statement of putting younger fighters in tough and seeing who has the mettle to emerge victorious. Colton, CA’s Artemio Reyes, 14-1, 11 KOs, was the first to show the world he is no stepping stone and in fact, might be a burgeoning action fighter as he took the fight to 2008 Olympian Javier Molina, 9-1, 4 KOs over the course of their eight round welterweight bout. From the outset, it appeared Molina’s movement along with his stellar amateur record would be the difference. Round one saw him move and jab effectively while Reyes stayed on the outside, sizing up Molina and looking to land some heavier leather. It was only late in the round that Reyes got in close and landed some nice hard jabs to build on for the future. In the second, the fight’s geography changed drastically as Molina let Reyes inside to work. Reyes was all too willing to oblige and took advantage of the chance to fight his fight. Working to the head and body of Molina, Reyes outworked Molina who let his hands go as well but with less authority and power. Round after round, Reyes was able to get inside and impose both his volume and strength on Molina who never gave up but was unable to keep the bigger man off of him. Reyes just seemed like the man who wanted it more. Everything he had struggled with outside the ring, from having to become a breadwinner in his household after his father was put in a coma after a 2008 car crash to suffering an early loss, seemed to come out tonight as he fought consistently hard throughout. In the end, the judges got it right by unanimous scores of 77-75 and 78-74 twice. Molina made a nice account of himself and will certainly learn from this. But it was Reyes’ night. As he was announced the winner, he let out a scream that seemed to come from deep within. Reyes moved about the ring ecstatic and you tell this win was the fulfillment of a dream; a dream that will allow him to move forward to bigger and better fights. He earned it. As a writer covering a sport that can turn even the most optimistic into cynics, I have to say honest efforts and moments like Reyes’ tonight are why fans watch and why I stay in this business. 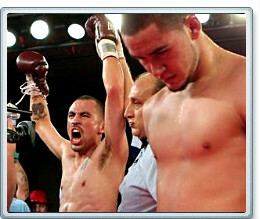 In the co-feature, middleweights Brandon Gonzalez and Ossie Duran put on a spirited fight as well. Gonzalez flashed speed early to go with solid movement. But like the first fight, it was Duran who seemed to land the harder shots throughout. Every time Gonzalez got off a flurry, it was Duran who landed a heavy jab, a left hook (a punch which took a few rounds to appear) or a looping right hand. The guard of Duran, which resembled a shield at times, seemed to puzzle Gonzalez who shot at it with one-two’s but left nary a dent. The first few rounds were close, possibly Gonzalez rounds as Duran’s output might have killed him in the fight. Quality is good but you have to land in quantity against a favorite. The middle of the eight rounder seemed to be Duran’s, as Gonzalez had suffered a cut on his left eye and seemed generally perplexed. With the fight on the line, his new trainer, Virgil Hunter, spoke honestly to his charge, willing him forward to win the fight. Gonzalez went out in the sixth and started to stick and move. He’d land a few shots and step to the side before Duran could do anything. It seemed to work to win the round for Gonzalez. Once again, Gonzalez seemed to respond. This was their first fight together though they have known each other and worked together in the gym a long time. You could see a trust there as Gonzalez attempted to carry out his orders. In the eighth, the fight could go either way though it all felt like a Duran win at the time. Both men went at it; Gonzalez with his speed, Duran with his power and strength. While it felt like either a draw or a Duran win to me, my opinion does not matter. The judges had it for Gonzalez by split decision much to the ire of the crowd at Atlantic City’s Bally’s Resort and Casino. Two judges had it 77-75 Gonzalez while one had it 78-74 Duran. Sometimes you win this one and look good in the next one. Time will tell if this is one of those cases. Above all, it was a spirited televised card that reminded us all why we have a love/hate relationship with boxing. Sometimes the wrong guy wins but sometimes, the unexpected man emerges to surprise us all.